Azza Karam is the Lead Facilitator for the United Nations Strategic Learning Exchanges on Religion, Development and Humanitarian issues. She represents UNFPA as Coordinator/Chair of the United Nations Inter-Agency Task Force on Engaging Faith-Based Organizations for Development; and she coordinates engagement with members of a Global Interfaith Network for Population and Development with over 500 faith-based organizations. Prior to UNFPA, Dr. Karam served as the Senior Policy Advisor in the Regional Bureau for Arab States at the United Nations Development Program (UNDP). 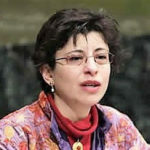 With the support of the Ford Foundation, she founded the first Global Women of Faith Network during her tenure at Religions for Peace, while also advising on interfaith development work in Muslim-majority countries. During this time, she served also as President of the Committee of Religious NGOs at the United Nations. She served as a Senior Programme Officer at the International Institute for Democracy and Electoral Assistance (IDEA) in Sweden; and an international consultant to several developmental programmes with UNDP and the OECD.